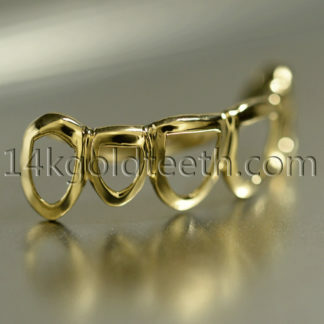 Our designers are specially trained to create exceptional gold teeth products, so our designers create all of our trendy and popular designs on our products. Our most popular design is the classic, solid design in yellow gold. The solid design is a timeless piece that follows the saying “less is more.” Not only is this a simple design, but the simplicity of this design offers a sophisticated appeal. However, depending on each customer’s preference, we also offer many other designs. We offer open face, diamond cuts, princess cuts, and diamond dusts. Our open face design features an open look that shows the natural shapes of the teeth. 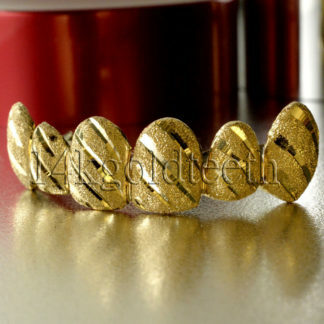 It creates a look that outlines the teeth while contrasting with the enamel color of the teeth. Our diamond cut design comes in many different types, such as princess cuts, starburst cuts, and trillion cuts. Each diamond cut product displays a type of cut into the product to create a unified, design. Our diamond dust design features a glamorous look that shows brilliance in every angle. After browsing through our many, trendy designs and there is not one that stands out, customers can create a custom order with their own design in mind. Please contact our customer service for more details and assistance about creating a custom design order. 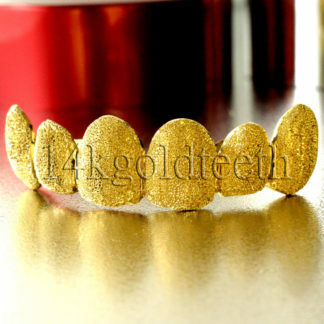 We offer each gold teeth item in different number of pieces. The customer is able to choose the number of pieces that they would like to order. The number of pieces can be customized upon the customer’s’ request, and the customer can also identify the teeth that he or she would like to have the product made for. We offer all of our products in 4pc, 6pc, and 8pc. For any other number of pieces, customers can call or email our customer service for custom orders. 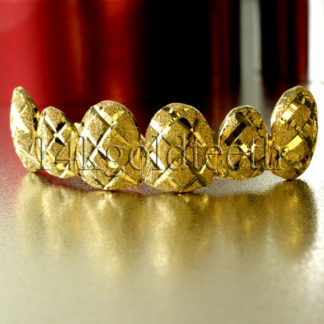 We make all of our grillz in different yellow gold karats. The number of karats determines the amount of gold we use in each product. The higher the number of karats, the more percentage of gold is used in making the product. 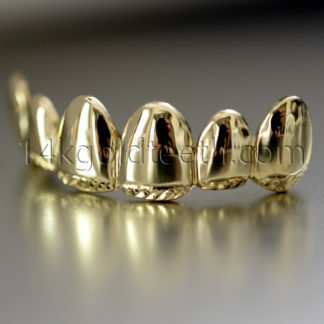 At 14kgoldteeth, we offer 10k, 14k, and 18k yellow gold. The 10k yellow gold includes 41.6% yellow gold, the 14k yellow gold includes 58.5% yellow gold, and the 18k yellow gold includes 75.0% yellow gold. Do we guarantee real gold? 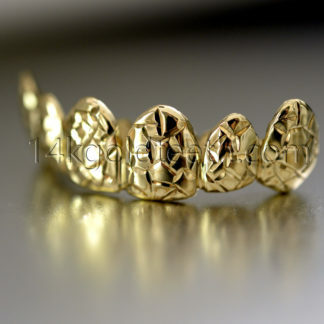 All of our products are real, genuine, and authentic gold. 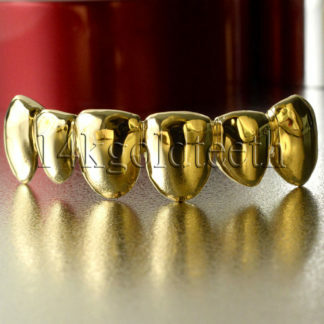 While there are many plated grillz being sold in the world today, our company specializes in custom gold teeth and we want each and every customer to be a part of our philosophy. Our product is not simply just an item. Our product is a lifestyle, a fashion trend, and a timeless piece to your wardrobe. 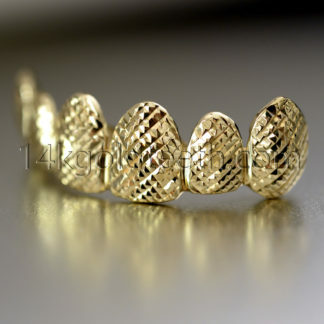 Because gold teeth are delicate and trendy items, we want our customers to feel proud when wearing them. Therefore, the only solution is to create authentic products so that our customers will feel special in them. 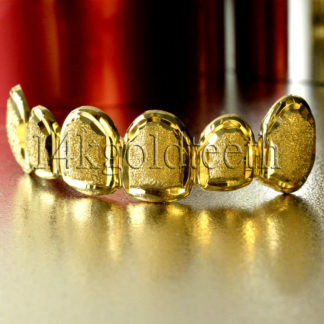 All of our products are created using different karats of gold, upon the customer’s choice. Because the products are genuine gold, customers do not have to worry about the color changing, as long as they properly take care of their purchase. 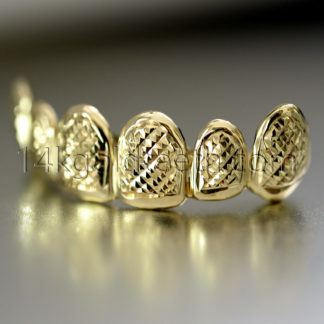 Our yellow gold products are all made purely from 10k, 14k, and 18k. The higher the number of karats in each item, the more delicate the item is. The 18k item has more gold than the 14k item, and the 14k item has more gold than the 10k item. Our white gold products are all made from purely 10k and 14k. White gold is an alloy of other strong metals with yellow gold, which means that it is more durable and scratch-resistant. So, the 14k white gold item has more white gold than the 10k white gold item. Can I get multiple designs? 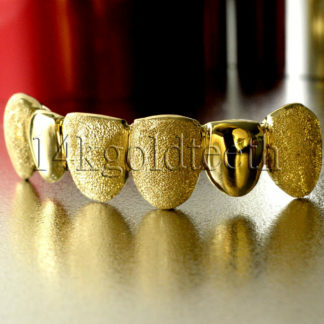 Since we are a custom gold teeth online retailer, customers may have more than one design on their product. While there are pieces such as the classic, solid yellow gold design and sophisticated diamond dust designs, some customers may not want their entire product to be simply just one design. Similar to the color scheme of an apparel outfit, customers may want to mix and match the colors and patterns of their clothes. Our product is not simply a product for the mouth. It is an elegant addition to the entire outfit. It is a fashion accessory that can pull together the entire look. Our top yellow gold product is a simple piece, but adding a few bedazzles could accentuate the entire appearance overall. With an accentuated point on your product, people will not be able to help but notice your glamorous smile. 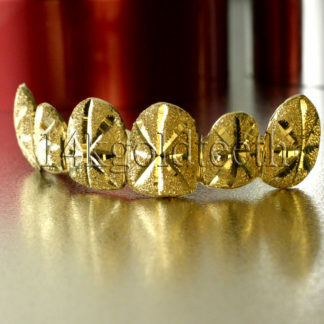 Mixing and matching designs is a great way to make your custom gold product unique and fitting to your personality. However, when ordering online, our product options do not have a separate option for mixing and matching designs. Therefore, if customers want to have multiple designs on their product, they will need to contact customer service to custom order their product. That way, the customer can specifically request multiple designs and our customer service agent can accurately place the custom order.